Since 2003, the Chicago Zoological Society (CZS), which manages Brookfield Zoo, has been a partner in the U.S. Fish and Wildlife Service’s (USFWS) Mexican Gray Wolf Recovery Program. 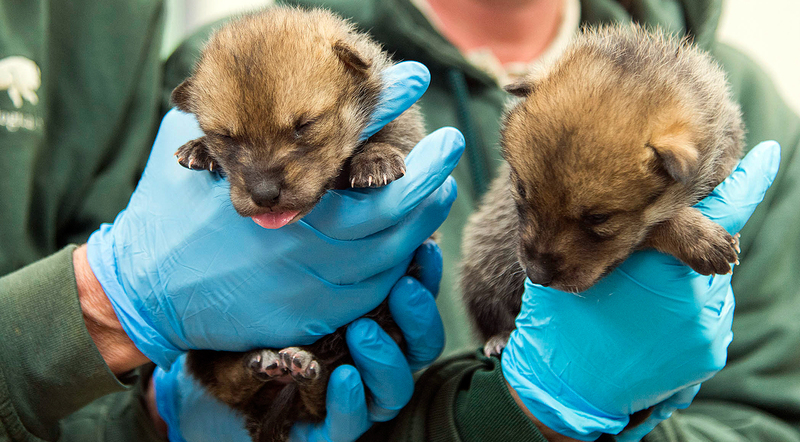 With the birth of the most recent litter of Mexican gray wolves to parents Zana and Flint on April 22, CZS had the opportunity for the second consecutive year to foster pups from Brookfield Zoo to a litter in the wild. 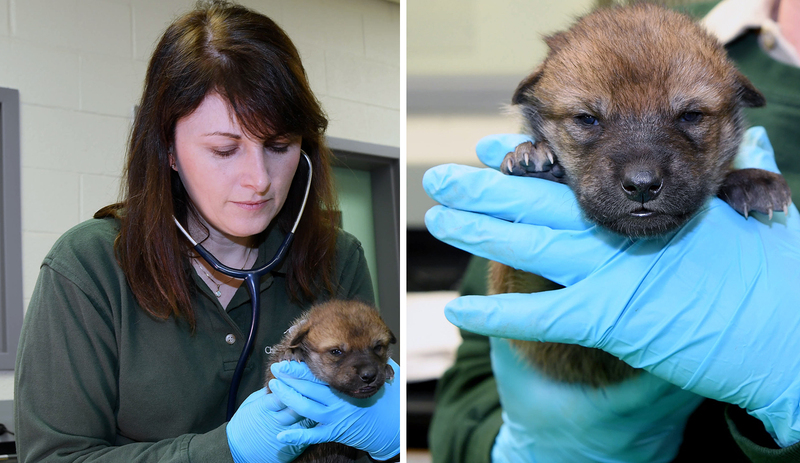 This year, however, CZS also brought wild-born pups back to be raised with the pack at the zoo. The process, called cross-fostering, maintains genetic diversity in both wild and managed populations of wolves. 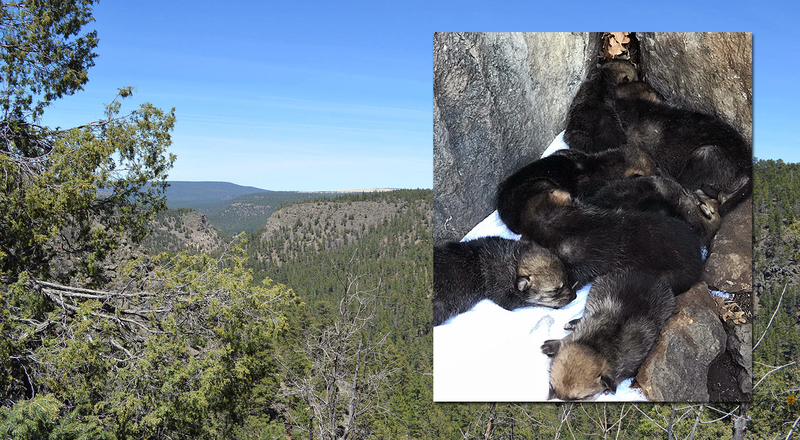 Three CZS staff members--Associate Veterinarian Copper Aitken-Palmer, Lead Keeper Lauren Gallucci and Senior Keeper Racquel Ardisana--escorted the pups on their journey to join the San Mateo wolf pack in New Mexico. Below, Lauren and Racquel recount their whirlwind thirty-two hour adventure. The day began early at the Brookfield Zoo Animal Hospital. CZS staff was assigned to one of two teams based on their roles for fostering: the “On-Site Team” and the “Travel Team.” The on-site team, led by Senior Keepers Dara Kelly and Lee Stahl, made their way down to the Regenstein Wolf Woods habitat to retrieve the puppies who would be fostered into the wild. Donning headlamps and carrying puppy care supplies, the team approached Zana’s den, quickly assessed all five pups, and retrieved the largest male and female puppy from the litter. The remaining wolves kept a watchful eye on staff from a safe distance away. Back at the Animal Hospital, the on-site team got to work performing neonatal examinations on both puppies, while the travel team made final arrangements, including preparing formula the pups would be fed on their journey. While the on-site team closely monitored the Brookfield Zoo pack on exhibit, we (the travel team) boarded an airplane at Midway Airport to begin our trek. At only 11 days old, the puppies required formula feeding every four hours, including one in-flight feeding somewhere above Kansas. Dr. Copper’s neonatal handling experience proved invaluable as we cared for the pups at 39,000 feet! We landed in Arizona, where the Mexican Wolf Interagency Field Team greeted us, eager to meet the new arrivals. In no time, we were assigned to vehicles and headed out toward the den site in New Mexico. Dr. Copper accompanied the pups to a staging location near the wolf den, while we drove to an observation point across the canyon to visually monitor wolf activity. On our hike in, the Interagency field team were able to track the signal from the alpha female’s radio collar, which we used to narrow down the den location and best vantage point for observation. With field scopes and binoculars, we observed the field team hike across the steeply-sloped terrain and locate the San Mateo pack’s den. We could hear other pack members howl as they moved down the canyon, displaying the natural inclination of wolves to travel away from human presence. Imagine our excitement when the alpha female moved within 100 meters of our location, directly below the cliff where we perched! Although we never saw the adult wolves, we heard their movements in the brush below us. We began our careers in animal care because we want to make a difference in wildlife education and conservation, connecting zoo guests to the larger issues in our natural world. Having the opportunity to make such a direct impact on the conservation of a species for which we care every day really hit home! Across the canyon, the field team continued their work counting pups (eight! ), providing basic medical evaluation, and selecting two pups who would become the newest residents of Brookfield Zoo. In addition to providing new genetic diversity in the managed population, the transfer of the two wild-born pups to CZS care prevents the wild mother wolf from being overwhelmed with a very large litter. Zana and Flint’s two puppies were placed in the den with the remaining six wild pups, becoming the fourth and fifth Mexican gray wolves released by CZS (Ernesta as an adult in 2012 and two cross-fostered pups in 2016). The one male and one female selected to travel back with us joined the rest of the team at the staging location, and were transferred into the care of Dr. Copper. The field team cared for our two new puppies throughout the night, and we awoke to begin the final leg of our journey, from Arizona to Chicago. We were greeted by CZS staff at the airport and taken back to Brookfield Zoo, reuniting with the on-site team who had been caring for the pack while we were away. We moved back as one team to the location where it all started: Regenstein Wolf Woods. We entered the habitat as a group, moved quickly and quietly to the den location, and added the two new pups to Zana’s litter. Scents are most important in the process of cross-fostering, so puppies (old and new) were rolled in the same den substrate, formula, and puppy feces and urine to ensure that they all smelled the same to the pack. This extra step goes a long way towards helping pack members accept the new pups as part of their own family. In the days since the puppies’ arrival at Brookfield Zoo, staff continues to observe positive behaviors from the entire wolf family. Zana is providing excellent maternal care, and while care staff maintains a very low disturbance presence near the yard, everything we see leads us to believe that the litter is doing well. We look forward to the next weeks when puppies emerge from the den and make their public debut, completely unaware of the tremendous impact they have had on the conservation of their species, and on us as their caretakers.